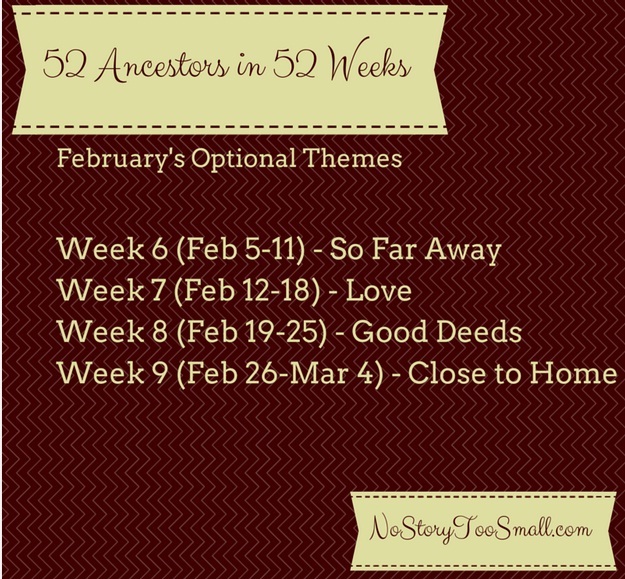 I participate on a monthly basis in Amy Johnson Crow’s 52 Week 52 Ancestor stories challenge. It’s funny how my story today speaks to all four weeks of February themes. Week 6 was “So Far Away”, Week 7 is “Love” – Week 8 “Good Deeds” and Week 9 “Close to Home”. My Uncle’s story definitely fits in every week this month – being so far away in Germany, showing so much love in his letters to his mother, father and sister; his good deeds over there will never be forgotten and finally he came back, closer to home. Amy’s choices for February stories couldn’t have been a more perfect fit for Leroy’s story and the hardest one I’ve ever written. I thank you for taking the time to read. 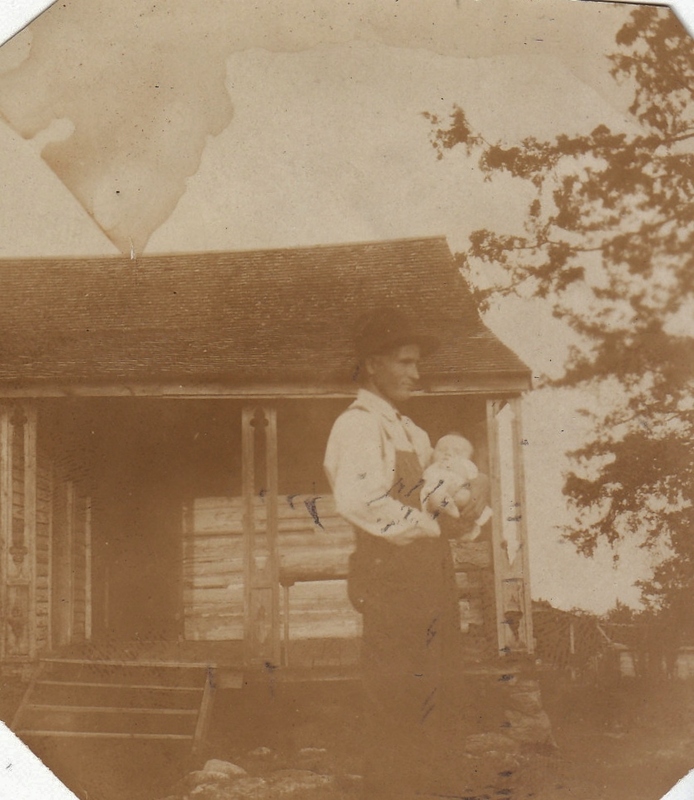 Leroy held by his father, Edgar McKinley, in front of the cabin where he was born in 1924. 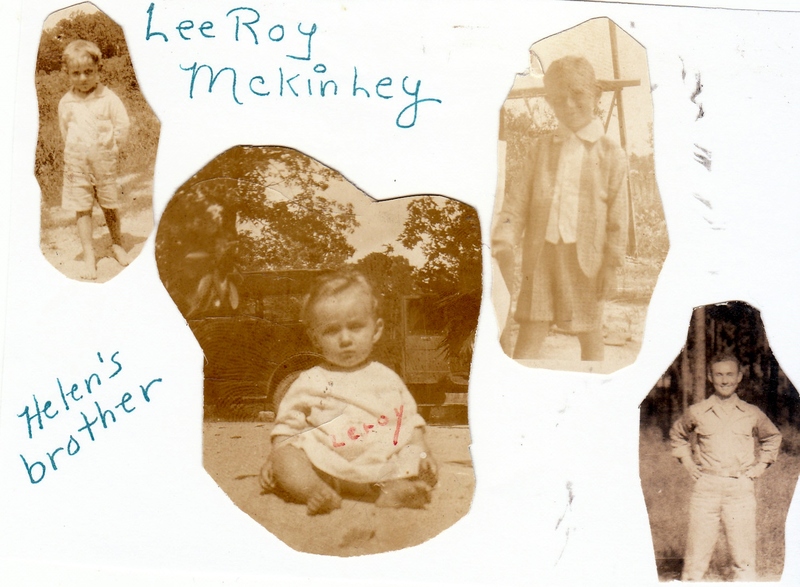 Leroy, the boy, was born on May 19th, 1924 in a tenant cabin to parents Edgar and Ola McKinley; his life began in the small town of Siloam in Greene County, Georgia. 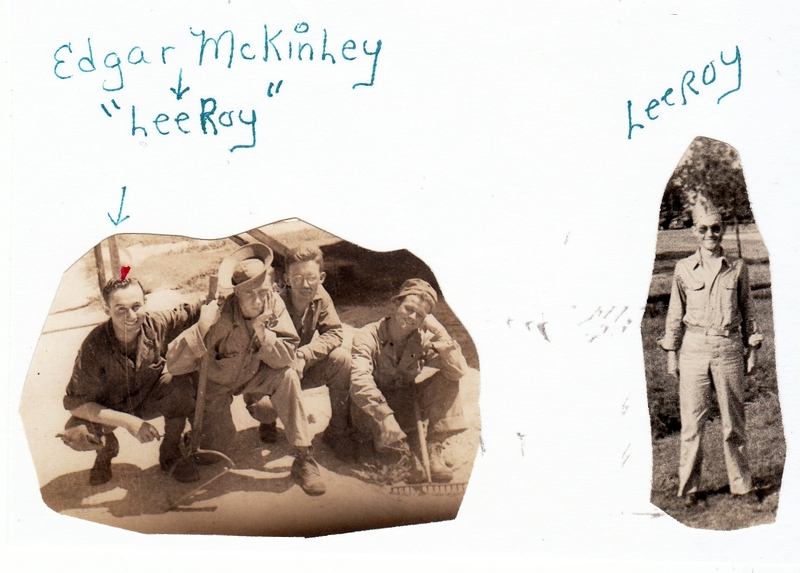 I have written before on my uncle, Leroy McKinley in the 2014 52 Weeks 52 Ancestors, but this story of much more detail, on his life, is shared to commemorate his death on February 19th, 1945 – a young life lost seventy years ago today. I’m remembering him today to say “Thank You” for your service and bravery shown during WWII. My middle name of Lee was given to me in his honor – and I gave that same middle name to my daughter and she has given it to her daughter who also is named McKinley – she really honors him having his name in reverse; he was often called Lee instead of Leroy. Like most boys living on a farm, Leroy grew up learning how to farm from an early age and was expected to work daily to help the family. His main chore was milking the cows in the morning before school and again in the evening; never without his cat, Clark Gable, who always came along for squirts of milk. 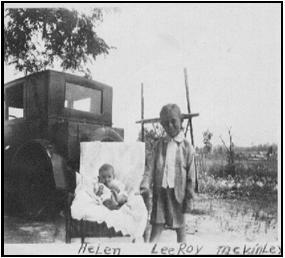 Leroy with baby sister Helen – and that T-model that he so loved to take apart – and drive his father crazy…. Leroy’s true love was working on the farm and playing baseball. He was an excellent marksman and mechanically inclined. In growing up, he constantly loved to tinker with his father’s old Model T parked under the shed. It would make his father so mad when Leroy took the engine completely apart – piece by piece – spread out on a blanket – but always put back together. School was not interesting to Leroy. but the game of baseball was – and he was very good at it. He played baseball with friends from a young age, often using nothing more than homemade bats and balls. By the time he entered eighth grade, Leroy and a couple other boys were good enough to join the school baseball team, comprised also of men from the Chipman Mill in Union Point, Georgia. It was said that these men, somehow, enrolled in school, but then would be gone by March when games ended. Those Friday night games drew a large crowd even with having no bleachers. Leroy was one of their main players – he was a left-handed batter and held his own up against men in their twenties. Often when Leroy batted, it was low and gone – out into the swampy area below the field. It was told that the principal suggested to the draft board that some boys needed to be drafted out of school – and that is exactly what happened to the only son of Edgar and Ola McKinley. Besides being needed at home to help his father and struggling with asthma, Leroy was drafted out of high school, only having one year in high school left to complete. Their reasoning was his grades were not good enough to warrant him staying in school and graduating. 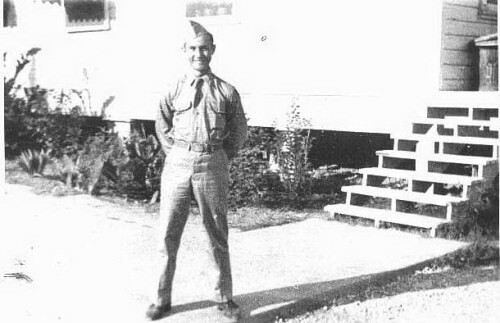 It wasn’t long before Leroy’s draft notice arrived – he was soon headed to Ft. PcPherson in Atlanta, Georgia as a new recruit; arriving for enlistment on October 16th, 1943. 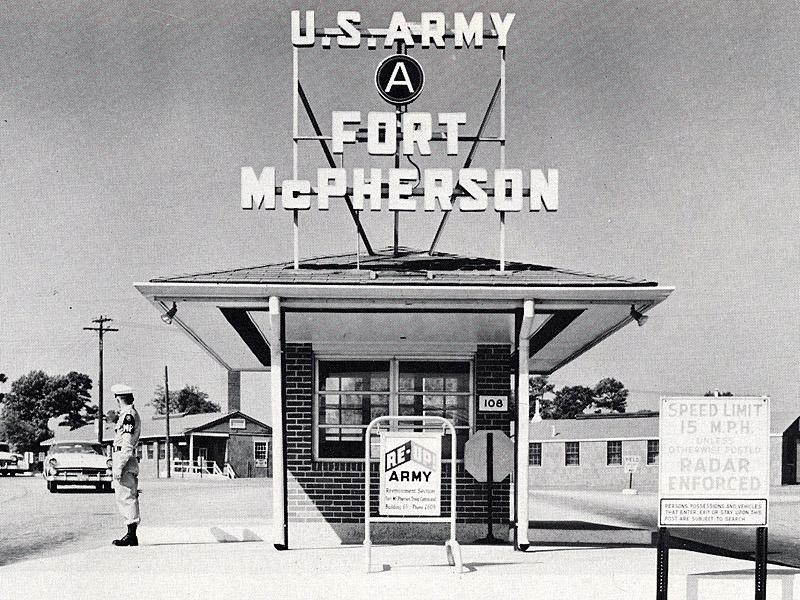 With the passage of the 1940 Selective Service and the outbreak of World War II, Fort McPherson expanded as a reception center to process thousands of men for entry into the service. This was where it first began for Leroy, but where he was sent for his six weeks of basic training and on the job training, if any, I don’t have those specifics. I’m assuming he was in Texas at some point before going overseas as that is where he married before leaving. My mom remembers her father driving Leroy to the train station and seeing him off. In knowing how my grandmother handled her only son being drafted, I can safely say she never brought herself to say goodbye at the train station. My grandmother never wanted to hear his name or talk about him after he left, and after his death, you couldn’t even mention his name to her. Leroy may possibly have been sent to Fort Wolters, four miles northeast of Mineral Wells, Palo Pinto County, Texas. It was turned into an Army camp from 1925 to 1946, and for a time it was the largest infantry replacement training center in the United States for the Army. This seems the most logical place that Leroy might have trained at, being it was located in the same county he married; or he may have come here after six-week basic training elsewhere, and from here he shipped overseas, but until I receive his papers, I can only guess. 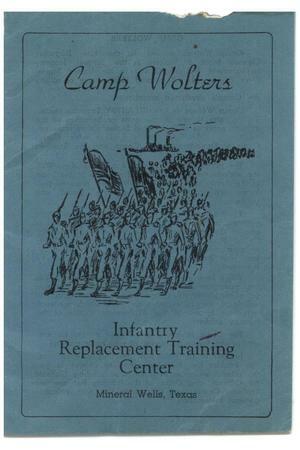 In reading through the booklet handed out to all new recruits at Camp Wolters, I feel that this was where Leroy spent his six weeks or more in basic training; the booklet mentions that this site was for boot camp Infantry training. The Infantryman is primarily a foot soldier – the heart of the Army and performs such duties as the attack, defense, guard, and police. Until I receive his records, if any, my assumptions and private-eye work will have to stand in as I piece his story together from the letters saved and records found online. Leroy McKinley – In reading through the booklet handed out to all new recruits at Camp Wolter’s, I feel that this was where Leroy spent his six weeks or more in basic training; the booklet mentions that this site was for boot camp Infantry training. The Infantryman is primarily a foot soldier – the heart of the Army and performs such duties as attack, defense, guard and police. Before Leroy left for boot camp, he broke up with the girl he had dated for a long time. Did that play a part in him quickly marrying another girl before shipping out to Germany? He was introduced to his future wife by another soldier in his company unit who was already married; she was actually his sister-in-law. He married on February 26th, 1944 in Palo Pinto, Texas. I have no idea how long he knew her before they married, but it had to have been a short romance as he had only been in the Army for a short four months; typical of what happened to many young boys shipping out to war. How does that happen? Did they feel the need to leave a loved one behind, possibly even an heir if they didn’t return? From the letters I have of his mother writing to him, I can feel the tone that this unexpected quick marriage broke her heart. Her only son was now married, leaving for war and they never met his new bride. I’m sure their first thoughts were – did she marry a lonely soldier leaving for war just in-case he didn’t return and they became the “widow with benefits.” Leroy still had feelings for the girl he left behind in Georgia and it gnawed at him while he was gone. Within the year, and before he died, Leroy divorced the girl he married in haste – well almost. 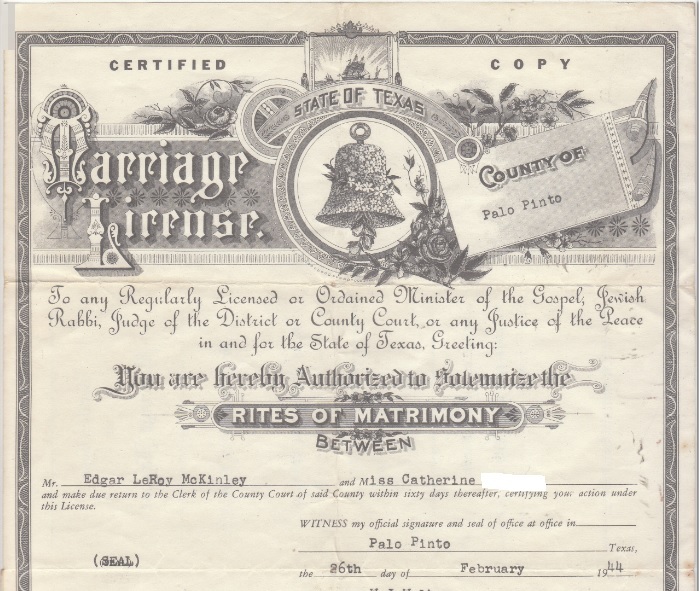 My mother remembers that the divorce still hadn’t been finalized at the time of his death but his wife relinquished everything back to Leroy’s mother – which is as it should have been. Leroy the soldier came home only once before shipping out and I’m sure he looked at the farm with different eyes on that trip home – being away for awhile. My husband served in the USAF and has always said – when you’re away in the service you learn quickly to appreciate what you had at home. In reading the letters written to my grandmother before his death and divorce from the new wife, she wrote how sorry she was in agreeing to the divorce and really loved Lee. I think that is the name he went by most often and what she called him. Catherine wrote how Lee never got over the Georgia girl and that was the problem – he still loved her. It wasn’t until after his death, that they finally met her when she came to spend time with them at the farm – she brought her sister along also. Catherine came again another time and stayed a few months – working in the mill in Union Point; that was the last time she ever came and finally, the letters ceased on both ends. 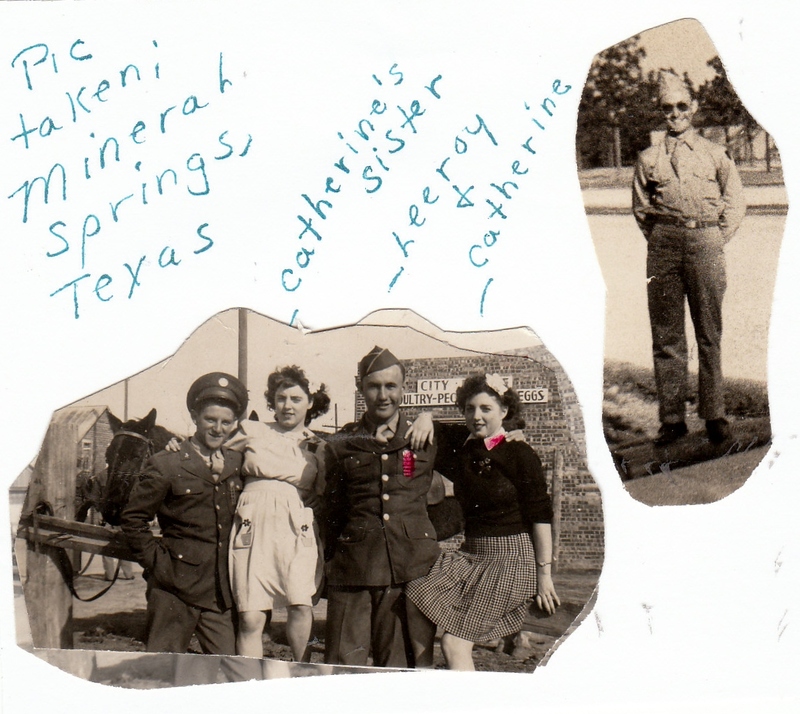 It wasn’t until I searched for Catherine several years ago, did my mother have contact again with her; I had found her through an obituary online of her late husband. She was very surprised to hear from me, a niece she never knew of, and learn of my search for her. I’m sure it was a phone call that she never thought would come as it did – out of the blue. I only wish now that I had asked more questions about Leroy during those conversations. She wrote a few letters to me and then they stopped – I didn’t pursue any more contact. At this time, not having any of his actual service records, I’ve attempted my best to piece together a time frame of where he was using the letters written home. 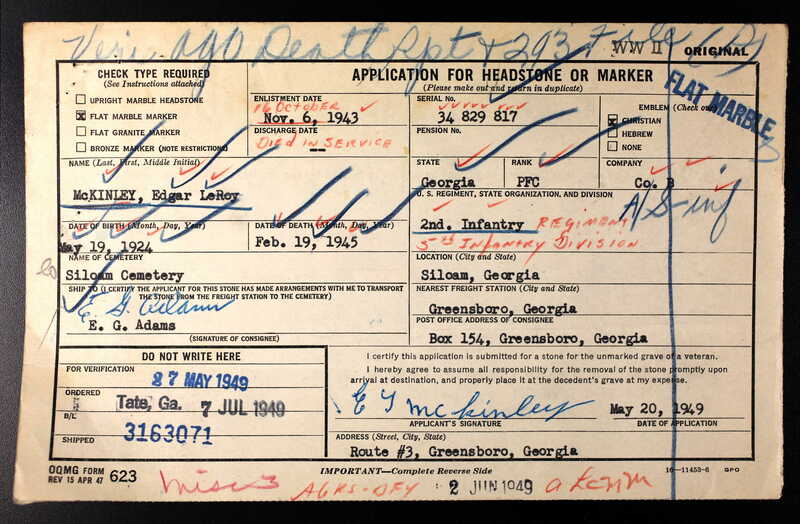 From several records, and with the help of other genealogists I’ve pinpointed his actual unit to be Company B, 1st Battalion, 2nd Infantry Regiment, 5th Infantry Division, serving in the Third Army. He was a replacement soldier who joined the 5th division after it was originally formed in Ft. Custer, Michigan; more than 300,000 troops trained there. This 2nd Infantry Regiment was in reserve after much brutal fighting when the Sauer River was first crossed. He most likely crossed it, but not under fire as the 1st Infantry did. In July of 1944 the 2nd Infantry Regiment along with the 5th Infantry Division landed in Normandy, France. It became part of General George Patton’s United States Third Army, capturing Rheims and seizing the city of Metz after a major battle at Fort Driant. I can only guess that Leroy was possibly there with his unit. From letters written home, he mentioned being in France, as well as Luxembourg, and this would be the correct time frame. 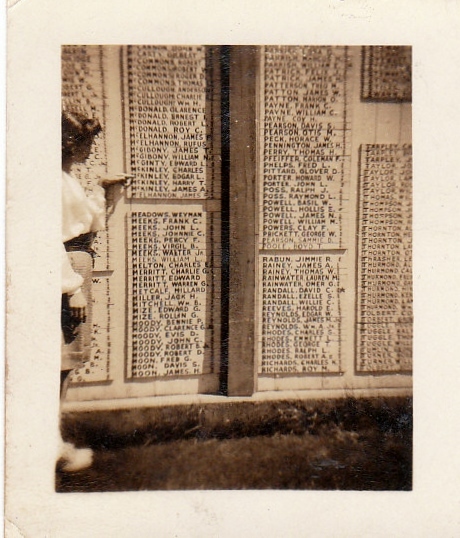 It’s written on back – Leroy in Belgium: Was he on RnR? Belgium was liberated while he was over there. There was never any mention on Belgium in any of his letters. 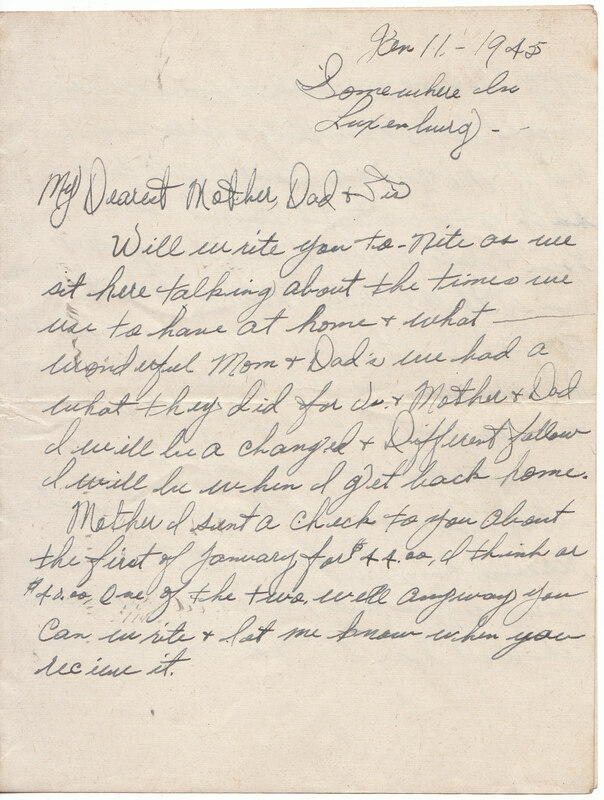 A letter to my grandmother from his wife dated September 30th, 1944 says…”I had a letter from Lee telling me he was on his way over. (This letter pin-points Leroy being overseas by that date)” The tone of her letter told me that they were already in the divorce process. Leroy seems to have initiated the divorce and even though she told him yes, she wrote his mother that she didn’t want the divorce and had asked Lee for a second chance. It seems she felt that it was the Georgia girl that Lee couldn’t really get out of his head – she had been his true love. She also wrote that Lee had broken his ankle awhile back and she wanted to go see him but her father talked her out of it – telling her that it wasn’t a good idea. My mother told me that it had been her father who told her that she really wasn’t entitled to any of Leroy’s money after his death as they hadn’t been married long enough – and the right thing to do would be to relinquish everything to his mother. 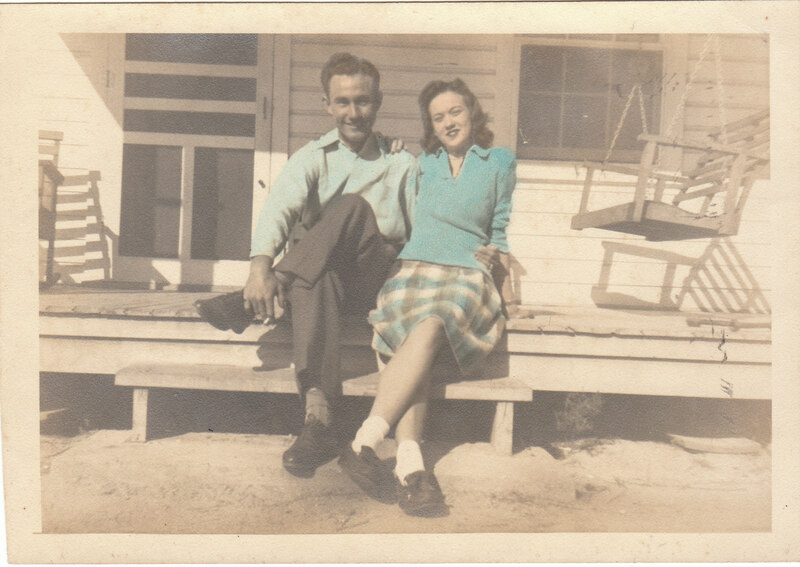 Their divorce wasn’t really finalized at the time of his death and she was considered his widow; she relinquished everything over to my grandmother, Leroy’s mother. 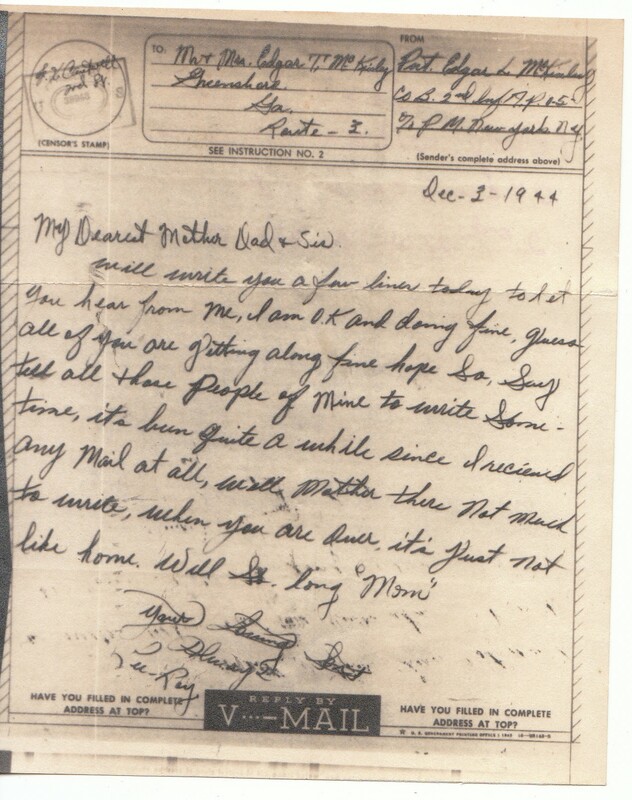 Leroy wrote his parents and sister on January 11th, 1945- the top of the letter reads, “somewhere in Luxembourg,” but it was the inside that left me in tears….” I sometimes wonder how things are going on the farm since I left, the same old way I suppose. Guess you still have plenty cows, hogs and plenty plowing to do, well now is one time I would enjoy plowing and I really mean it. There would be no grumbling and growling out of me. “None”. Someday I will come back and I want to get married, settle down and have a nice little place of my own with my wife and for Mother & Dad to stay there with me and I mean to be together. Not me roaming around all the time and I also want to see a lot of Sis.” This letter places Leroy in Luxembourg. 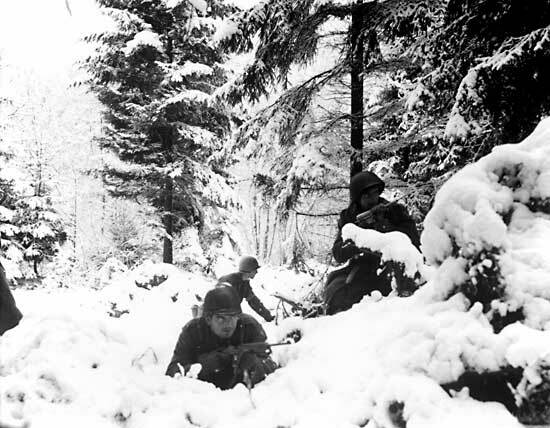 When the Battle of the Bulge began, the 2nd Infantry Regiment moved to the battle zone in the area of Niederanven, Luxembourg. Niederanven is a small commune and town in Luxembourg. Its population was 1,476 in 2001 and located north-east of Luxembourg City. I’m sure it was even smaller than this in 1945. The country of Luxembourg is bordered by Belgium to the west and north, Germany to the east, and France to the south. The night of February 6th was the first night troops prepared to cross the River Sauer, but with the cold and snow, and the swollen river, only two boats and sixteen men managed to make land on the eastern bank. Those sixteen men were now on the enemy side and all alone. There had been several boats starting out, but they capsized almost immediately – dumping many soldiers into the icy water. Those sixteen that made land had been under a constant fire from the German machine guns in their struggle to cross – now alone. I can’t even imagine what ran through their minds as they struggled to find cover. The Sauer River, which separates Germany and Luxembourg, was flooding at this time of the year. The water line extended up and quickly covered the roads on both sides of the river. The Germans had placed mines along their German riverbank so even when the troops managed to reach their side; they risked the chance of their boat hitting a mine at the shore. They also had to watch for mines as they walked, as well as the underground bunkers where the Germans were hiding in wait. Leroy sent a letter to the local newspaper. 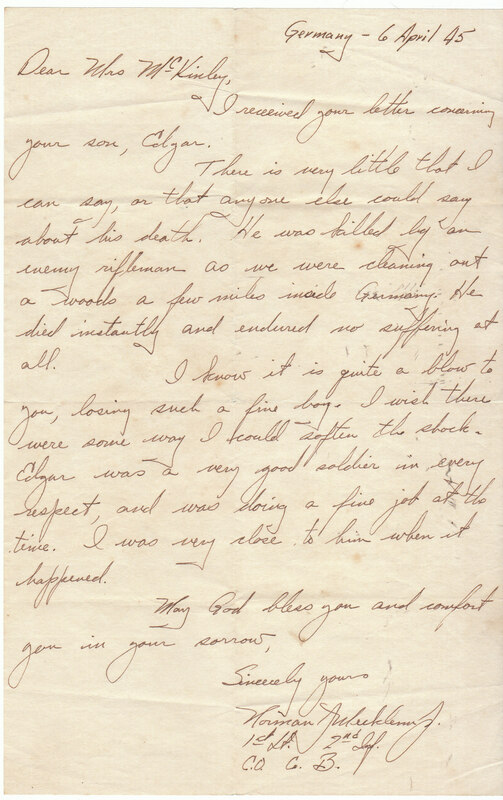 This letter mentions he was in France – most likely at the Battle of Metz. 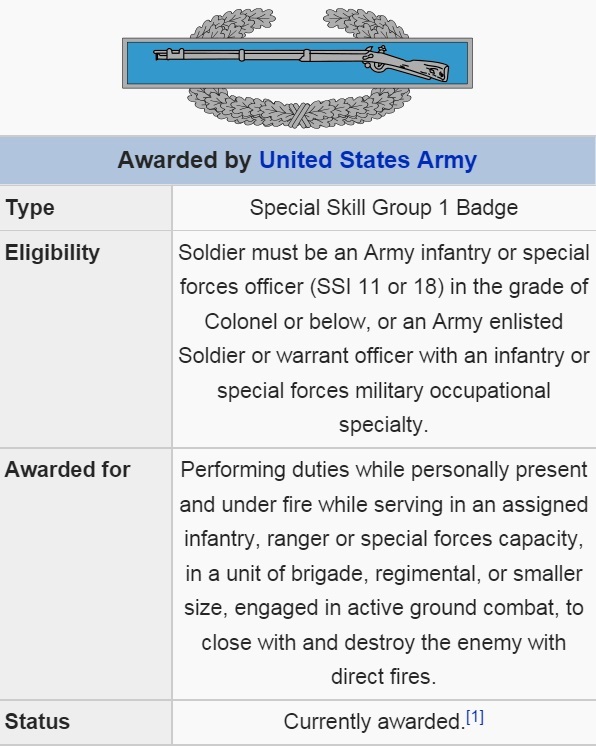 It was also mentioned here that he had been awarded the Expert Infantryman Combat Badge. He noted that it was cold and freezing – remember he was a Southern boy; it was snowing but not too deep. The following morning, a few reinforcements arrived and crossed, followed by additional boats loaded with more infantrymen, along with heavy machine guns to support them. 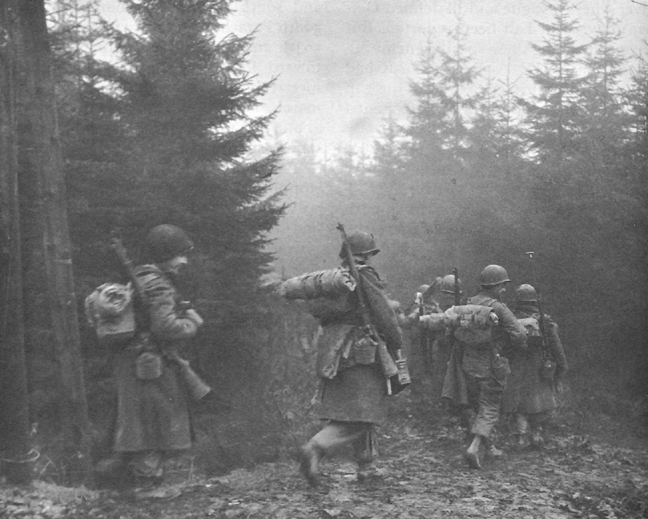 It wasn’t until later on February 11th that the rest of the unit successfully crossed the Sauer River and then the American’s finally made headway as they began their advancement into Germany. As darkness covered them on February 7th, those sixteen American soldiers were now alone opposite their troops – alone in Germany! Although my uncle was not one of those initial sixteen – he was nearby supporting them – himself waiting to cross when the order was given. It was this area of Luxembourg where he wrote his final letters home to his mother, father, and sister – my mother. This was where the soldiers first gained entrance into Germany and pushed the Germans back. This was the area where Leroy was killed thirteen days later – in a woody area, just inside Germany. 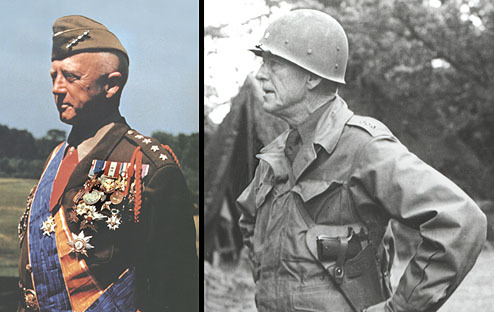 Gen. George Patton (right) and Gen. Courtney Hodges Patton photo from Patton Museum, Ft. Knox. Hodges photo by Marvin Mischnick, 3AD HQ. One of the generals who led alongside Gen. Patton was Major General Courtney Hodges. What intrigued me when I first read his name, was that I knew that name! I remembered hearing that he was from my hometown of Perry, Georgia – it was also his hometown and where he was born. My mother mentioned him to me several times in growing up as she knew some of his family. His father was very prominent in Perry in starting the local small town newspaper there. One of our main routes into town was re-named for him and bore his name. Hodge’s troops were the first ones to reach and liberate the French capital of Paris – he then continued with them through France, Belgium, Luxembourg and on into Nazi Germany. He led the 3rd Army but relinquished it to Gen. Patton before the Battle of the Bulge and continued on with the 1st Army. 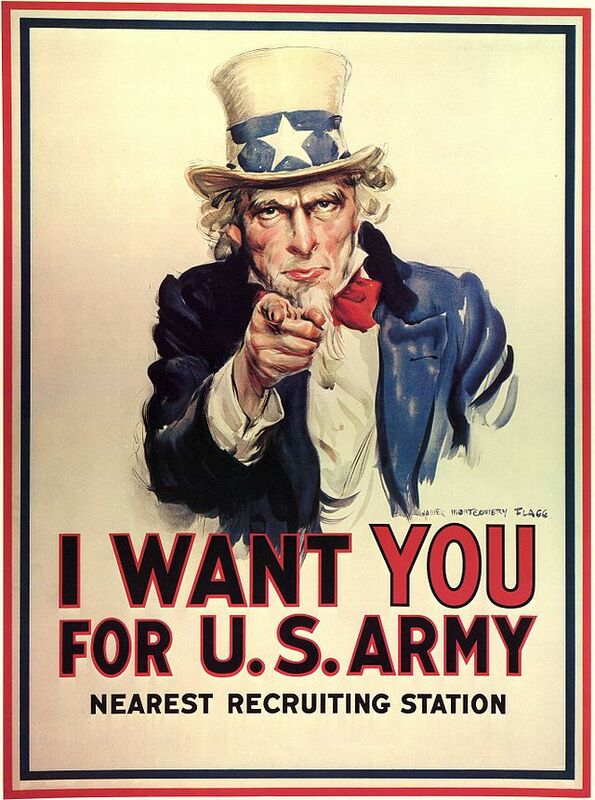 The Third Army was the military formation of the United States Army that saw service in WWII. It was best known for its campaigns in WWII under Gen. George S. Patton. There were huge numbers of drafts that brought young men into service – in the Armed Forces. The Ardennes was a rough forest of rough terrain and rolling hills that extended through France, Belgium, Luxembourg and down into Germany. Possibly it was this forest area mentioned where Leroy was killed; the Ardennes was the site of the Battle of the Bulge. 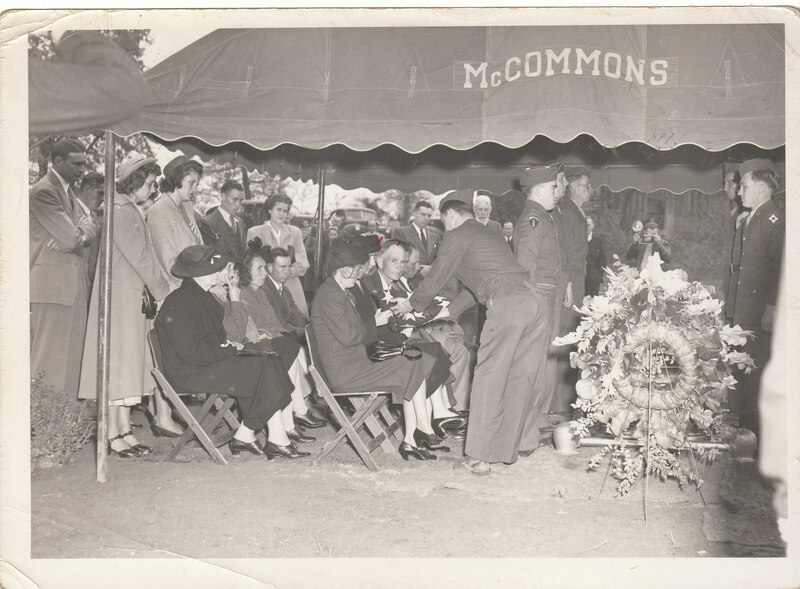 I can’t even imagine how hard it was for Lt. Mecklem to write my grandparents a few months later – even harder for them to receive such a letter of condolence from their son’s unit commander. A few words from that letter: “There is very little that I can say about his death. He was killed by an enemy rifleman as we were cleaning out a woods – a few miles inside Germany. He died instantly and endured no suffering at all.” Sad to imagine how many letters he wrote during those long months of fighting. It wasn’t long after, that the box containing the fruitcake was returned – and it must have been right before she was told of his death as she fell down on the ground saying “my son is dead.” What was the turnaround of informing the parents or spouse of a loved one’s death? I’m sure it couldn’t have been in a timely fashion. 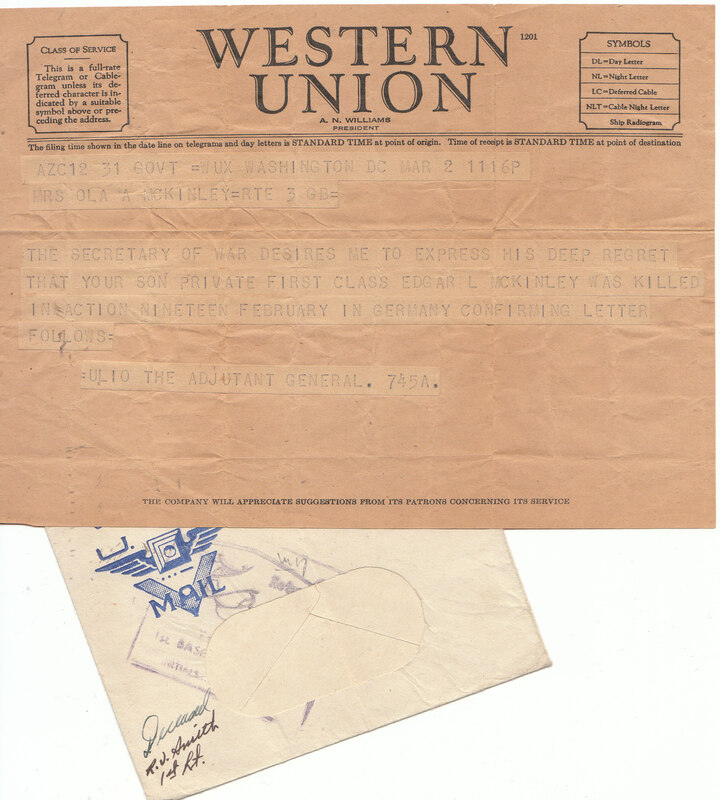 I believe this telegram was delivered by the Army as my grandfather heard the news while in town and was told that the Army was headed to his farm – he tried to have them held so he could arrive first but they were at his house before him – he found my grandmother standing in the yard crying – my son is dead! A few months later of continued fighting the German Army finally fell and surrendered on May 5th 1945. 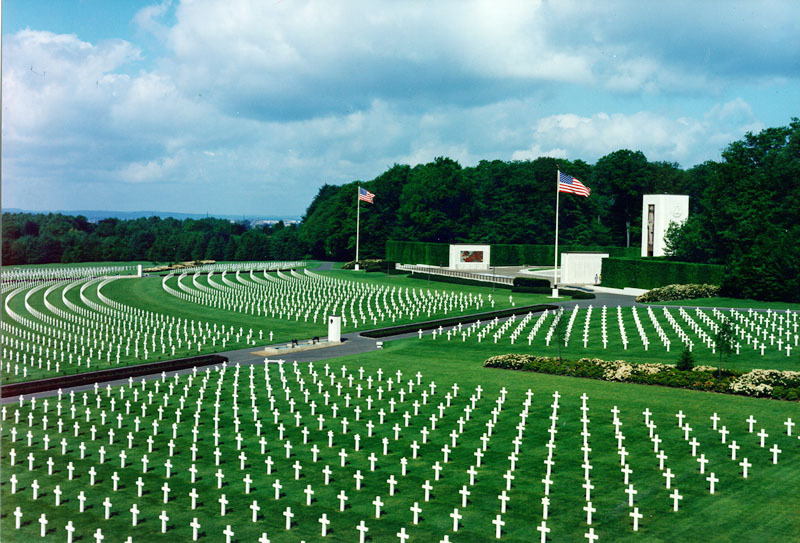 Many of the brave soldiers who died while fighting in Germany are buried at the Luxembourg American Cemetery and Memorial located in Hamm, Luxembourg City, Luxembourg. It is administered by the American Battle Monuments Commission under a US-Luxembourg treaty signed in 1951 giving the US government free use in perpetuity of the land covered by the cemetery, without taxation. This was a soldier’s final resting place unless the family requested the body to be returned home. They were not returned home until much later. The fallen soldiers were usually buried in local secured cemeteries until they were shipped home. The Luxembourg cemetery covers 50.5 acres and contains the remains of 5,076 American service members. On twenty-two separate occasions, two brothers rest side-by-side in adjacent graves. Most of the interred died during the Battle of the Bulge which was fought nearby in the winter of 1944/1945. 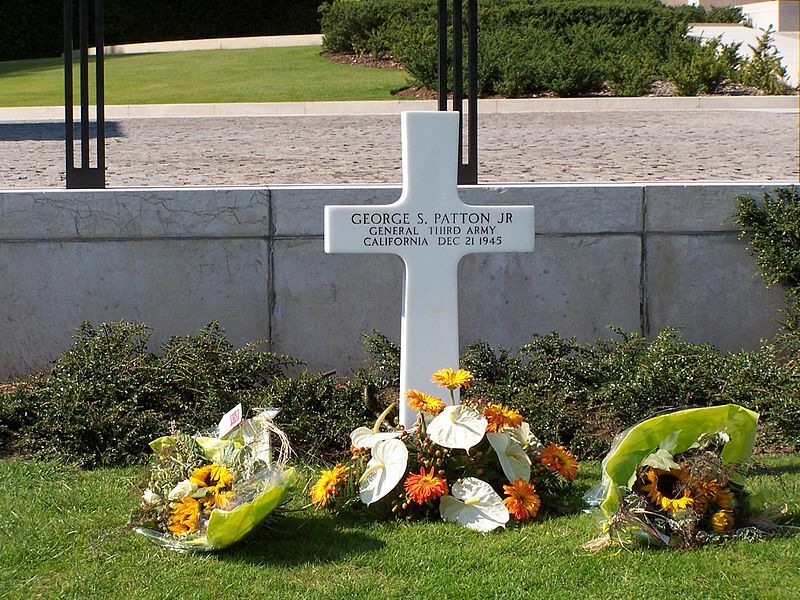 Two flagpoles overlook the graves area – and situated between the two flagpoles is the grave of General George S. Patton, Jr. 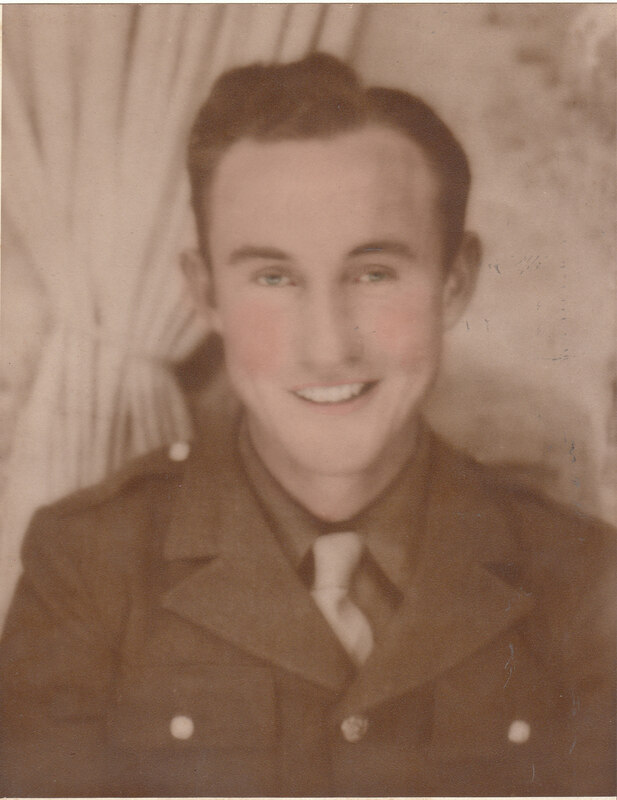 If Leroy’s body had not been returned for private burial, per his parent’s request – the Luxembourg Cemetery would have been his final resting place alongside his fellow soldiers who proudly fought for our freedom. They were brave young men – fighting far away on foreign soil – and most never had been away from home before. It was two years later before my grandparents were able to say goodbye and bury their son. My mother was not able to attend her only brother’s funeral as she was married, living in Memphis, Tenn., very pregnant and due at any time with her first child. Leroy’s name posted on a WWII roster in Greensboro memorial. My mom pointing out his name. 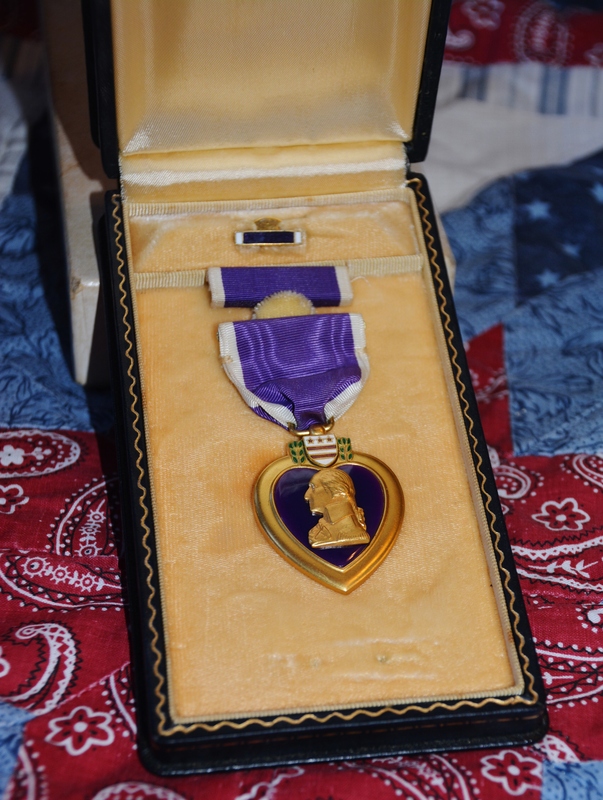 Leroy received the Purple Heart medal posthumously – it rests in my trunk along with the flag that was presented to my grandmother. It was originally sent to his ex-wife because his divorce papers were not received from the Army in time, but she sent it to his mother – feeling she should have it. Leroy’s death has always tugged at my heart – he was my mother’s only sibling and his death left her an only child. There was so much unknown before I began my search, and read and re-read those letters saved. My mother always felt like her brother wasn’t close to her, but in the way he spoke about her in his letters, always asking about her and sending his love – he was thousands of miles away from home and still thinking of her and wishing her well. This story of his life and service has deeply touched my heart as I say a final Thank You for your service Uncle Leroy, you will never be forgotten. 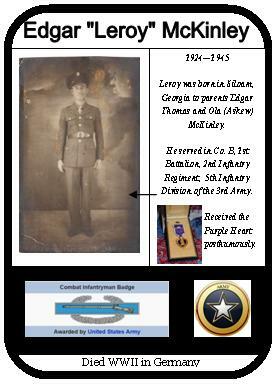 This entry was posted in 2015: 52 Weeks 52 Ancestors, Family Stories and tagged Camp Wolter's, draft, Fort McPherson, General Hodges, Georgia, Leroy McKinley, Lt. Norman Mecklem, Luxembourg, Patton, Perry, purple heart, Sauer River, Siloam, V-Mail, WWII. Bookmark the permalink. Congratulations Jeanne on this wonderful tribute to your uncle Leroy. My living in Luxembourg made it even more special. If the Allied Forces had not liberated Luxembourg when my mother was a little girl she may not have ever had the chance to meet and marry my father. Thank you! Thank you for reading Cathy – I’m sure you can relate so much to the area of which I”ve written. I’m very glad our guys were there for your mom – It was all meant to be. I’m happy to have met you, even though we’ve never met face to face – I feel we have a connection. Jeanne, this is a wonderful story. So heartwarming, as well as heartbreaking. I wish my mother were here to read it. Somehow I believe she was sorta close to Leroy because of all the pictures she had of him. She mentioned him a few times but it could have just been that family memories she was talking about. Leroy was 7 years older than Mother, so she would have been about 13 when Leroy shipped out. As genealogist, we find stories like this along the way but few touch home so closely. Thank you for sharing so much from your heart. Thank you, Cousin Leroy, for your service and sacrifice in fighting for our freedoms. You will never be forgotten, not will your service. Lynn, thanks for reading and your kind words. It was such an honor to have been able to pull all the pieces together into a story. I truly feel I know him so much more now after writing this. I just wish he could have come home and I was able to know my mother’s only brother. It’s just terrible to think of all those young boys that fought for our freedom and never had a chance to have a life of their own. I wrote this so he will never be forgotten. Jeanne, fabulous job! What a wonderful tribute to your uncle. I feel like I know him and that my father-in-law served in the 2nd Regiment with a truly distinguished soldier. He always said the only decoration he respected was the Combat Infantry badge. Schalene, thank you for your kind words. Who knows maybe my uncle and your father-in-law actually might have come in contact with each other. What a small world. Thank you again for all your help in pointing me in some directions. What a beautiful tribute to Leroy and his sacrifice. You invested a lot of time and heartfelt inspuration to write his story and share it. This is why we do genealogy. treeklimber Thank You for your kind words. It was truly an honor to put my time into that story. I can’t wait to send it to my mom to read. Congratulations Jeanne for getting this story published in the Greensboro, Georgia, newspaper! 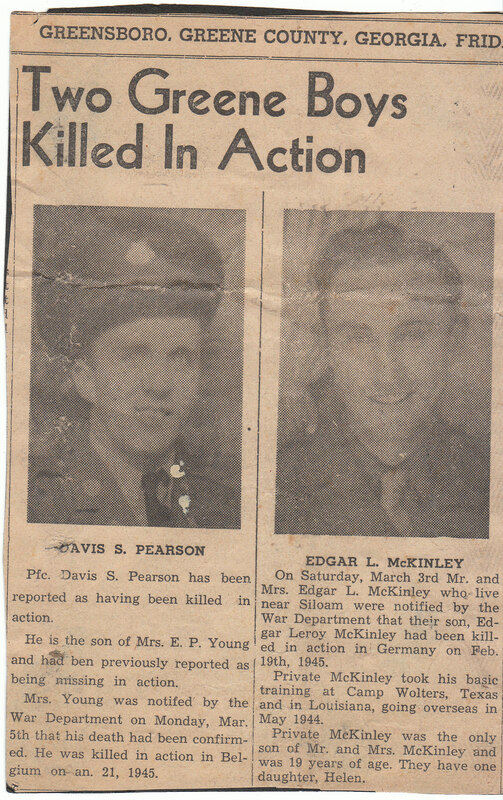 I’m sure my grandfather is smiling down on this story of his son and of his bravery in WWII.